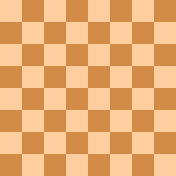 In the game of chess, perpetual check is a situation in which one player can force a draw by an unending series of checks. Such a situation typically arises when the player who is checking cannot deliver checkmate, while failing to continue the series of checks gives the opponent at least a chance to win. A draw by perpetual check is no longer one of the rules of chess. However, such a situation will eventually result in a draw by either threefold repetition or the fifty-move rule, but usually players agree to a draw (Burgess 2000:478). Perpetual check can also occur in other chess variants, although the rules relating to it may be different. For example, giving perpetual check is not allowed (an automatic loss for the giver) in both shogi and xiangqi. White to move gets a draw by perpetual check, starting with 1. Qe8+. 3. Qe8+ etc (Reinfeld 1958:42-43). The same position will soon repeat for the third time and White can claim a draw by threefold repetition; or the players will agree to a draw. Perpetual check extricates Black from his difficulties. salvaging a draw by threefold repetition with checks on h4 and f2. Down massive amounts of material, Black forces a draw by perpetual check. The Oxford Encyclopedia of Chess Games, Volume 1 (1485-1866) includes all recorded games played up to 1800 (Levy & O'Connell 1981:ix). The earliest example of perpetual check contained in it is a game played by two unknown players in 1750: N.N. versus Unknown, 1750 1.e4 e5 2.Nf3 Nc6 3.Bc4 Bc5 4.0-0 (the rules of castling not yet having been standardized in their current form, White moved his king to h1 and his rook to f1) Nf6 5.Nc3 Ng4 6.d3 0-0 (Black moved his king to h8 and his rook to f8) 7.Ng5 d6 8.h3 h6 9.Nxf7+ Rxf7 10.Bxf7 Qh4 11.Qf3 Nxf2+ 12.Rxf2 Bxf2 13.Nd5 Nd4 14.Ne7 Nxf3 15.Ng6+ Kh7 ½-½ in light of 16.Nf8+ Kh8 17.Ng6+ etc. (Levy & O'Connell 1981:9) The next examples of perpetual check in the book are two games, both ending in perpetual check, played in 1788 between Bowdler and Philidor, with Philidor giving odds of pawn and move (Levy & O'Connell 1981:12). A draw by perpetual check used to be in the rules of chess (Reinfeld 1954:175), (Reinfeld 1958:41-43). Howard Staunton gave it as one of six ways to draw a game in The Chess-Player's Handbook (Staunton 1847:21). It has since been removed because perpetual check will eventually allow a draw claim by either threefold repetition or the fifty-move rule. If a player demonstrates intent to perform perpetual check, the players usually agree to a draw (Hooper & Whyld 1992).